It is the author’s responsibility to ensure that the paper do not infringe any existing copyright. Furthermore, the author indemnifies the editors and publisher against any breach of such a warranty. Authors should obtain letters of permission to reproduce or adapt copyrighted material and enclose copies of these letters with the final version of the accepted manuscript. It is also the author’s responsibility to protect the anonymity and confidentiality of the respondents or to obtain letters of permission from the respondents if such anonymity and confidentiality are to be compromised. Author/s is fully responsible if there is an issue pertaining to any litigation of the paper submitted. By submityting articles to us, it is meant that the author/s has agreed with this copyright agreement. Manuscripts must be original and must not have been previously published or be under concurrent consideration elsewhere. Please send electronic copies of your manuscript to klibel@hotmail.my in Microsoft Word format only. The editors and publisher of IJBEL have made every possible effort to verify the accuracy of all information contained in this publication. Any opinions, discussions, views and recommendations expressed in the article are solely those of the authors and are not of the JOURNALS, its editors or its publisher. THE JOURNALS, its editors and its publisher will not be liable for any direct, indirect, consequential, special, exemplary, or other damages arising therefrom. Authors should prepare their manuscripts according to the guidelines. Manuscripts that are not prepared according to these guidelines may be returned for revision prior to any editorial consideration. Manuscripts should be typed 1.5-spaced on only one side of the paper. The type on paper should be clear and readable. Margin – Manuscripts must be in single spacing, font size 12 in Times New Roman and all margins: 1.5 inches (left) and 1 inch (top, right and bottom). Length – Manuscripts are maximum 500 words or 15 pages (including references, attachments, tables and graphical information). Tables – Must be placed as part of the text. Title – Written in uppercase, bold, size 14 and centered. Author/s – Name, address, email and contact number of all authors, font 12, Times. Abstract – between 250-350 words “Times New Roman” size 12. Keywords – should not more than FIVE keywords. Title/sub-title – Written in uppercase, bold, size 12 and left margin. Tables/ Figures – title of the tables/figure should be written on the top of the tables/figure. Times New Roman, font 12, Bold, lower case, centered. Reference – Should be in the last part of the article (before any attachments/appendixes), in alphabetical order, according to American Psychological Association (APA) style. Arize, A. C. (1994). A re-estimation of the demand for money in small developing economy. Applied Economics, 26, 217-28. Blyton, P. & Turnbull, P. (1998). The Dynamics of Employee Relations, 2nd ed., London: McMillan Press Ltd.
Treviño, L. K., & Nelson, K. A. (2007). Managing business ethics: Straight talk about how to do it right. Hoboken, NJ: Wiley. 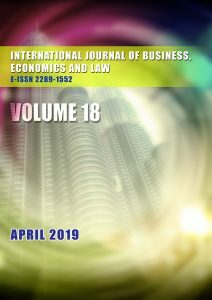 Submission fee is not charged to authors, However, if the paper is accepted for publication, author(s) will be asked to pay USD80 as article publication fee in order to consider the operating costs. The payment method will be notified by the editor after the acceptance of the paper.